Welcome to our sewing machine slide plat springs page. Here you will find a large selection of sewing machine slide plat springs. Click on any part to get more information including a complete listing of compatible sewing machines and alternate part numbers for a specific slide plat spring. 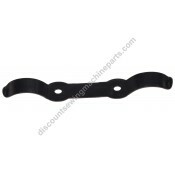 Slide plate spring compatible with free-arm slide plate #116080 and flat-bed slide plate #310739-451.. Fits the following Singer sewing machine models15-91..
Singer slide plate spring for the machines listed below. Compatible with slide plate #163447. NOTE..
Singer slide spring compatible with slide plate #44838-891. Please match the correct spring per pict.. Most common 15 class, 239, 237 and others. For slide plate 15147. Measures 2 11/16" long, holes ar.. Fits plate #32569.Fits the following Singer sewing machine models 185, 192, 99, 66..
Singer silde spring, compatible with slide plate #44838-891 for models 240 series, 250-series, some ..
Singer slide plate spring compatible with slide plates #408034 and #445847.Fits the following Singer..
Slide plate spring compatible with slide plate #446481 and slide plate 356715Fits the following Sing.. Compatible with slide plate #172956, for flat bed models using needle plate 174198.Fits the followin.. Compatible with slide plate #382710, for free-arm models using needle plate #174198.Fits the followi..
Includes left and right. Compatible with slide plate #313166.Fits the following Singer sewing machi..
Slide plate spring for slide plate #45358.Fits the following Singer sewing machine models 1200-1, 20..
Singer zig-zag needle plate for slant.Fits the following Singer sewing machine models 403, 500, 50..